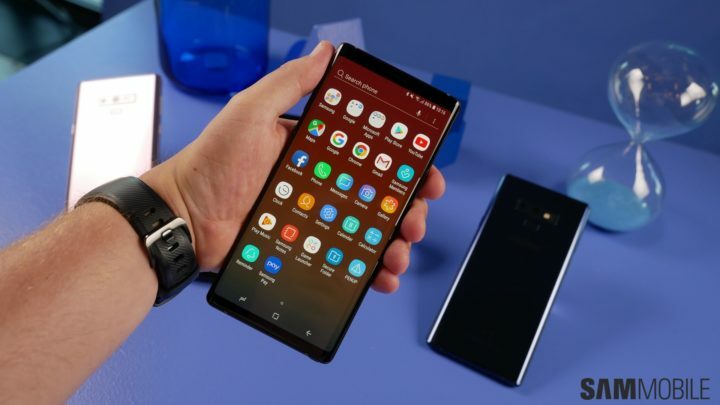 The Galaxy Note 9 is Samsung's eighth-generation Galaxy Note flagship that succeeds the Galaxy Note 8, which was an excellent smartphone that brought the Note lineup into the modern age thanks to the Infinity display and a dual rear camera. The Galaxy Note 9 was unveiled on August 9 in New York City and brings many upgrades, both over the Galaxy Note 8 and the Galaxy S9+. The Galaxy Note 9 isn't too different from the Note 8 when you talk about the design. The one major change is the position of the fingerprint sensor on the back. The sensor is placed below the camera for easier access. The phone is also overall thicker and slightly wider than the Galaxy Note 8 thanks to the bigger battery inside. You won't feel it in everyday use, however, as Samsung has used diamond-cut edges to make the phone look and feel slimmer than it really is. The Note 9 is also water and dust resistant thanks to its IP68 certification. 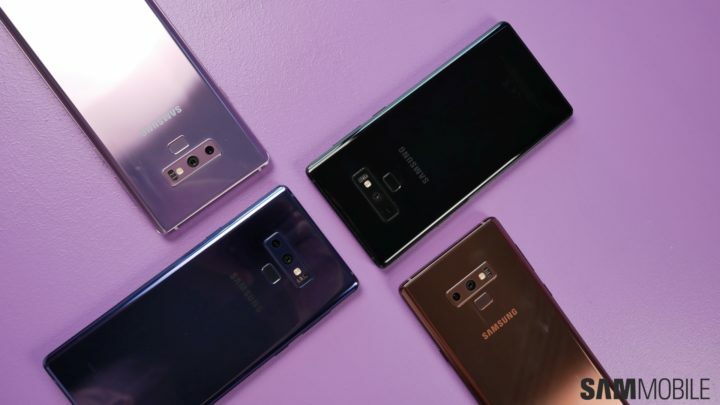 The Galaxy Note 9 comes in four color options: Lavender Purple, Ocean Blue, Midnight Black, and Metallic Copper. 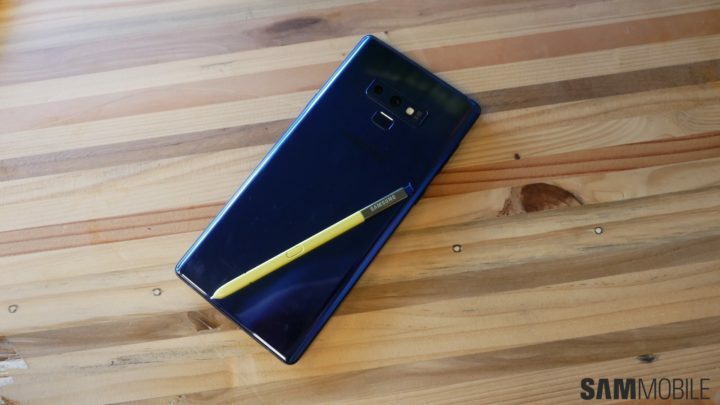 The Ocean Blue variant is the one Samsung is using in its Note 9 promotions thanks to the yellow and blue S Pen. Metallic Copper is the most interesting new color, though. 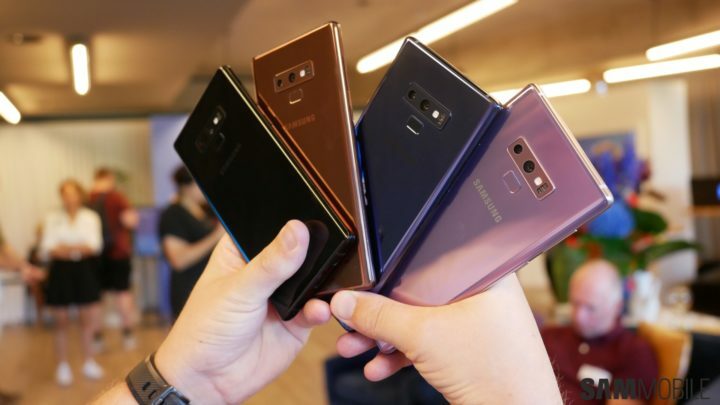 And as with previous Samsung flagships with an Infinity display, the front of the phone is all black no matter which color you pick for a more immersive viewing experience. Complementing the display are stereo loudspeakers with Dolby Atmos support. The phone comes with AKG-tuned earphones in the box. The Galaxy Note 9 gets a 6.4-inch Super AMOLED Infinity display with the same specs as the one on the Galaxy Note 8. The screen resolution is 2960x1440 pixels (WQHD+), but the resolution is set to Full HD+ (2220x1080) by default. The screen is curved on both sides and comes with Gorilla Glass 5 for protection. 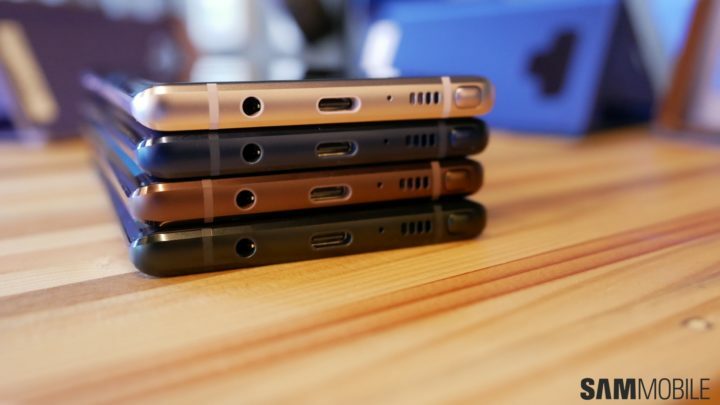 It's the largest display on a flagship Galaxy smartphone and supports HDR. 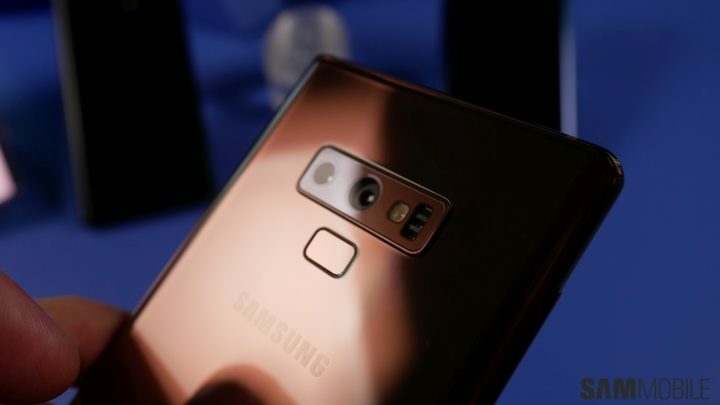 The Galaxy Note 9 comes with a rear camera with two 12-megapixel sensors and an 8-megapixel front camera. It's the same setup as the Galaxy S9+, but Samsung has built in new software features for enabling users to take better pictures. The Scene Optimizer feature detects the type of scene being captured, matches it to around 20 presets, and adjusts contrast, white balance, exposure, and more accordingly. Flaw Detection detects issues such as someone blinking or the phone moving too much when a photo is being taken and warns the user so they can take the photo again. Last but not the last, the S Pen can be used as a remote shutter button in the camera app and also for browsing through pictures in the gallery app. The rear camera has a Dual Aperture lens that switches between apertures of F1.5 and F2.4 depending on the lighting in the scene. The secondary rear camera allows 2x optical zoom and Live Focus pictures that blur the background around the subject. Dual Pixel technology is on-board as well for blazing fast autofocus, and both rear cameras have optical image stabilization. You also get Super Slow-mo video recording, which turns a 0.2 second moment into a six-second video. 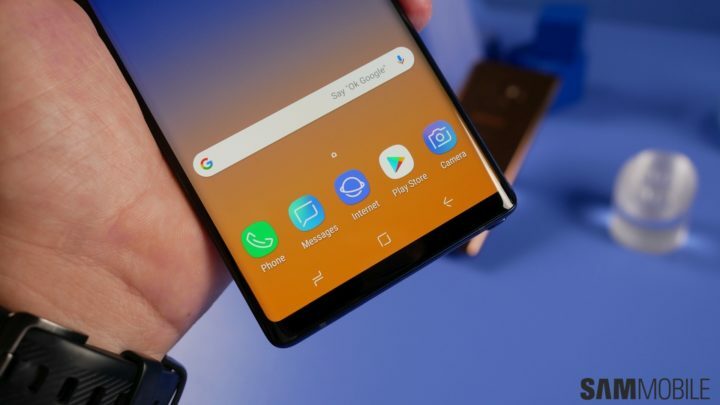 The Galaxy Note 9's S Pen has Bluetooth built-in and, in addition to letting you take pictures remotely, the stylus can also be used to navigate through presentations, pause or skip a YouTube video, and more. Other features include the ability to write on the display even when the screen is off and creating live messages that can be sent as GIFs to friends and family. The Galaxy Note 9 is the first Samsung flagship to come with 8GB of RAM and a whopping 512GB of internal storage. The base model gets 6GB of RAM and 128GB of storage, along with a microSD slot that officially supports 512GB cards. The processor inside is an Exynos 9810 for all markets except the US, Japan, and China, where it comes with the Snapdragon 845. Samsung has also added a new water cooling system inside that reduces chances of overheating during gaming and heavy usage by 21 percent. The Galaxy Note 9 also supports Gigabit Wi-Fi and Gigabit LTE, with the latter going to up to 1.s2 gigabits per second, the fastest of any smartphone (except the Galaxy S9 and S9+). It comes with dual SIM slot in some markets. For security, it has an iris sensor and facial recognition, both of which work together when the Intelligent Scan feature is enabled. The Galaxy Note 9 has a 4,000 mAh battery inside, the largest ever for a Galaxy flagship (not counting the Galaxy S Active series of phones). Samsung says it can power the device all day through heavy usage and is also tested to be completely safe. The Note 9 gets fast wired and fast wireless charging like all other Samsung flagships in recent years. The Galaxy Note 9 runs Android 8.1 Oreo with the Samsung Experience 9.5 user interface. The highlight on the software front is the DeX Mode, which lets you connect the phone to an external monitor with a USB Type-C to HDMI adapter and get a desktop experience without the need for a DeX station. The phone will get two major Android upgrades, including Android 9.0 Pie, based on Samsung's usual policy. Security and minor updates, meanwhile, will come for three years. The Note 9 supports Samsung Pay and comes with Bixby 2.0, the newest iteration of Samsung's virtual assistant. The Galaxy Note 9 release date is August 24, 2018. Pricing begins at $999 in the US for the base model will 128GB storage and 6GB of RAM. Prices in other markets can be seen at the Samsung website for a particular country and at local retailers.